Worshiping together with those who understand and love the gospel should be the highlight of every believer's week. We enjoy making much of God and rejoicing in His infinite beauty and worth. We hope no one leaves our Sunday services unchanged as we gain a better understanding of the supremacy of God through the preaching of His Word. Why? In Matthew 28:19-20, Jesus said to go make disciples of all nations, baptizing them and teaching them to obey His commandments. This includes the call to teach not only adults but also children. This is the central focus of the worship service; to receive instruction through the written Word of God. The pulpit ministry of PBC is expositional preaching, which is explaining the text consecutively through a book or unit of the Word, applying it to our lives, and pointing us to Christ. We believe this should be the main diet of believers (although not exclusive). At times it is good to teach topically or doctrinally while still practicing sound exegesis and exposition of the texts. Our musical worship contains God-honoring and Christ-exalting lyrics for us to respond to God for who He is and what He has done through His Son, Jesus Christ. Our music and instruments are meant to accompany and carry the singing, not over-power it. They function as a servant for the congregation providing background for preparation and meditation, both as a prelude and postlude to service. But we prefer families to worship together as we do not have children's church or mini children's sermon. We understand that children need to learn how to worship God and hear His Word. Squirms and cries are welcomed but there is also a Children Training Chapel room available for those training their children to sit still and quiet in worship and for nursing mothers. 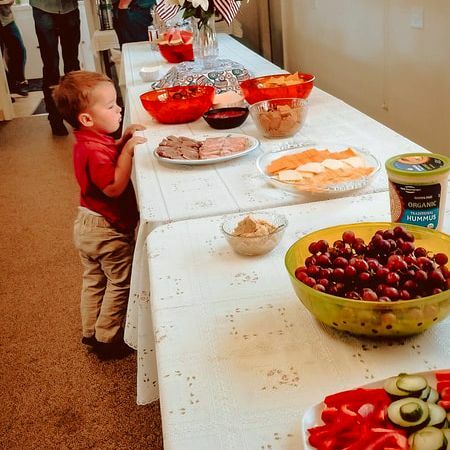 After service people stick around for snacks and fellowship - greeting one another and discussing life, ministry, theology and everything in between. On the first Sunday of each month we have a Manna Rest meal, which is a pot-luck style meal - everyone is invited!